We have cancer. Actually my hubby does, but in fact, it is both of us because everything he goes through, I am right there by his side. I think being a Girl Scout Leader for so many years has helped me stay organized. My biggest hurdle so far is the effort to eat healthy. Most people don't know that cancer FEEDS ON SUGAR. That is why they put sugar through your veins during a pet scan. The sugar runs to the lymph nodes and lights them up. Don't tell anyone, but the science part of my brain, found the photo irresistible. Everyone's pancreas lights up automatically. What does that tell you? CONTACTS:doctors, oncologists, radiologists, nurses doing the drip, etc. MEDS: I color-coded each medicine on a calendar I made from a Word Table. I automatically can glance each day and know what color pill to take out. I even made a four-colored box poster for the table with breakfast, lunch, dinner, and bedtime labels. I simply use my chart to put the appropriate pills in each box. He just has to grab them with no thinking involved. SCHEDULE: Make another table with spaces for the first three months. Highlight or color the blocks a different color for treatment days. NOTES: I write down EVERYTHING the doctor's or nurses say. I also take notes from books I am reading. Because food plays such an important part, I put notes from those books also. CONSENT FORMS: There are consent forms for everything. Keep them in this safe place. DIRECTIONS: They give you directions for each of the medicines. Keep them here. RESULTS: You REALLY want these in this section. I have his blood results handy from each office visit. I can compare them from the previous ones and understand what is happening. This is enough for today. I will start a post tomorrow on the diet. It took us three full weeks before the first drip to wean ourselves off of sugar. Then when the hubby had a spinal leak from a test, the doctor told him to drink a coke. I just looked at him cross-eyed. I did NOT stick my tongue out or flip him the bird. I am VERY PROUD OF MYSELF. By-the-way, EVERY med has side effect of mouth sores. Get your doctor to order Nystatin (swish and swallow). Use three times a day during first eight days. We found four teaspoons of GLUTAMINE every day really helps reduce these and up the immunity system. Read about it. Tell your doctor you are going to take it anyway if they balk. Add Vitamin D to the rest of the meds. Ordinary oncologists, and even ones from John Hopkins won't let you take probiotics or vitamins unless you've been on them for years. They don't want anything to interfere with the chemo soldiers. 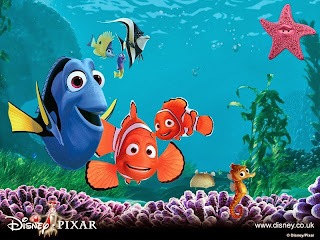 Keep your sense of humor: I told people about the Nemo idea, I said, "The only difference between Buzz and Nemo is that he won't be sleeping with the fishes." I am thinking about you and Buzz everyday! I love that you are putting your amazing organizing skills to good use! And I am CERTAIN that your positive energy will help Buzz through everything. Mouth sores are also something I know WAY TOO MUCH about - sublingual b12 (methylcobalamin) helps with mouth sores. You can order it on Amazon. Thank you for this post. It is helpful not just for people fighting cancer, but for anyone with an serious chronic illness or infection who has to deal with doctors, hospitals, meds. rehab, etc. Such a useful notebook set-up - thank you. I am also so sorry to hear about Buzz. I am glad you are in it together, because with your energy and spirit, you can conquer anything.